Does anyone know of a 5 point star pattern that is not paper pieces. I searched and found paper pieced patterns but really do not want to make one that way since I do not paper peice. Thanks! Also, couldn't one take the pp templates here and just cut apart and add seam allowances? Just wondering. Last edited by dakotamaid; 06-08-2013 at 06:30 AM. Buggy Barn has one. There is one in EQ as well. It is at an angle however. You can also cut the paper pieced ones apart and 1/4 inch seam allowance. This is the one in EQ. If you like this one, PM me. Because of the weird angles with 5 points, you would probably want to use templates for cutting if you don't want to paper piece. You could always do applique for this as well. Fusible applique works quite well with this design because it is fairly easy to machine stitch down with all those straight lines once you have fused it to your background. If you are concerned about stiffness of fusible use Misty fuse or "window" the fusible product before fusing it to your applique fabric. 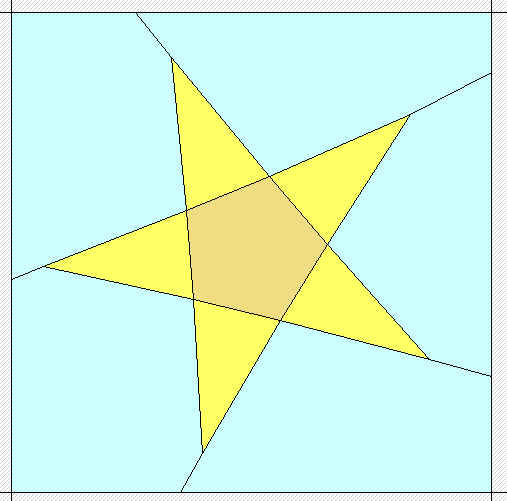 The five pointed star is very easy to PP. Why not try it. There was a time that I didn't PP as well as every other person who now does PPing. You can at least try it on this super simple pattern block. What have you got to loose? You might decide you actually like to do PP. I make dark backing then you will not see the grass stains! A gift is a gift!!!!! Quilts are made to be used!!!! !